Mariel here. I recently paid a long-overdue visit to one of my closest childhood friends – a fellow food lover who ferreted me to her favorite spot in the beautiful Black Mountains of North Carolina. We both suffer from eyes-bigger-than-stomach syndrome, so when she insisted I order a full-size portion of Verandah‘s famous Hungarian Mushroom Soup in addition to an enormous Hot-Pressed Panini, I figured, whatever, I can handle it. I could have stopped at the soup. It was hands-down one of the most delightful bowls I’ve ever dug into. Not typically a fan of creamy emulsions, this rich, brothy brew gets the ratio just right. And it’s incredibly filling – a meal unto itself. I promised my friend I’d attempt to recreate this soup at home and I think I’ve done Verandah’s version justice. In my opinion, this is just as lip-smacking, bowl-licking delicious as the original, but she’s the real expert, so fingers crossed she signs off on it. 1. In your largest stockpot, saute the onions in 4 Tablespoons of vegetable stock over medium-low heat until the onions become tender and start to caramelize. About 10 minutes. 2. Add the mushrooms, dill, 1 cup of vegetable stock, ½-cup of water, soy sauce, paprika, tomatoes, and tomato paste. Cover and simmer for 15 minutes. 3. Meanwhile, in a large saucepan, melt the butter over low heat. Whisk in the flour and cook 1 minute. Very slowly add the milk and stir frequently until combined. Cook over low heat for 10 minutes until the milk thickens – make sure to continue whisking frequently to prevent the flour from sticking to the bottom of the pan and burning. 4. Pour the cream sauce into the mushroom mixture. Add the remaining ½-cup of water and 1½ cups of vegetable stock and combine well. Season with freshly ground pepper and taste to see if you need to sprinkle with salt. Cover and simmer for 10-15 minutes. 5. Just before serving, stir in the freshly-squeezed lemon juice. Taste the soup and adjust the salt and pepper according to your preferences. Serve hot, alongside a crusty piece of bread. 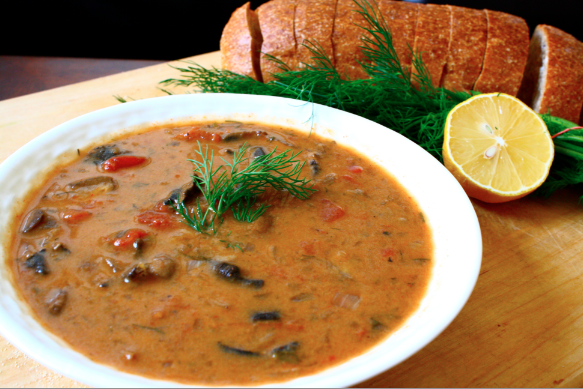 This Hungarain mushroom soup looks really rich and exciting! We just love anything with mushroom already, but your recipe really just divine! this looks amazing! i’m super into soups right now. What a beautiful rich and hearty looking soup. For the most part, I am only able to get white button, portobello and brown mushrooms here so I hope they will do the trick! This sounds delish! To save money, I am leaning towards using the dry mushrooms I have in the pantry. Thanks for posting. This looks so hearty and delicious! I love soup and so does my Hungarian friend Colleen- I’m going to forward her this link ASAP! She’ll love it! Hope you had a great Thanksgiving!! My roommate and I just made this. We are now stuffed and satisfied. Perfect soup for a rather stormy day in Portland, OR! This recipe will be a staple in both of our recipe boxes. Thank you!